Behind the Picture: Medgar Evers’ Funeral, June 1963 – Time In 1994, eight black and four white jurors found 74-year-old white supremacist and long-time Klan member Byron De La Beckwith guilty of first-degree murder in the 1963 killing of civil rights activist and U.S. Army veteran, Medgar Evers. De La Beckwith had been tried decades earlier for the infamous and gutless crime—he shot Evers in the back, with a rifle, as the 37-year-old father stood in the driveway of his Jackson, Miss., home—but two trials ended in hung juries. When De La Beckwith was finally held accountable for the assassination on this day in 1994, Evers’ widow Myrlie, who had fought for justice for her husband for more than 30 years, felt she might finally be free of the anger and hate she had borne for so long. 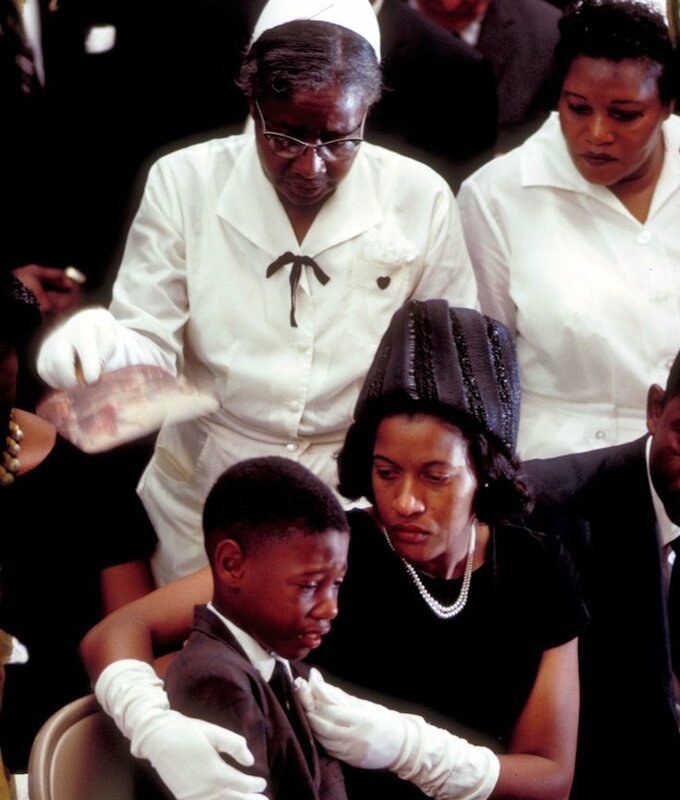 Here, LIFE.com presents a series of photographs by John Loengard—including one that remains among the most stirring of the Civil Rights era: a portrait of a dignified, deeply grieving Myrlie Evers comforting her weeping son, Darrell Kenyatta, at Evers’ funeral. The National Association for the Advancement of Colored People (NAACP) is a civil rights organization in the United States, formed in 1909 as a bi-racial organization to advance justice for African Americans by W. E. B. Du Bois, Mary White Ovington and Moorfield Storey. Its mission in the 21st century is “to ensure the political, educational, social, and economic equality of rights of all persons and to eliminate racial hatred and racial discrimination.” Their national initiatives included political lobbying, publicity efforts, and litigation strategies developed by their legal team. The group enlarged its mission in the late 20th century by considering issues such as police misconduct, the status of black foreign refugees, and questions of economic development. Its name, retained in accordance with tradition, uses the once common term colored people, referring to people of some African ancestry. The NAACP bestows annual awards to people of color in two categories: Image Awards are for achievement in the arts and entertainment, and Spingarn Medals are for outstanding achievement of any kind. Its headquarters is in Baltimore, Maryland. (Wikipedia).